August 2015 – on my way: make it someday. training camp in the Jura. Coming from North America, I often think that the other side of whatever country I’m in is very, very far away. Happily, here in Switzerland things are a little closer together. I live in Zürich and while the nearest big mountains are at least an hour away, nothing is very far. Going south or southwest through the Alps takes a few hours, but driving across the Swiss Plateau to the French border is easier. A few weeks ago I was able to take part in a training camp in Les Cernets, which is on the border with France. Literally, after dropping our bags off at the inn where we were staying, Fabian and I ran up a hill a few kilometers and peered into the European Union. We followed a well-marked trail and there was a small monument at the top of the height of land. Anyone could take this route into France, although of course you have to get into Switzerland first, which is no easy feat. The camp I joined was with the Swiss Academic Ski Team (SAS), a group of college and older athletes. Once you are a member (I’m not), you’re a member for life, so a few masters-aged athletes also join us and sometimes kick our butts. Ironically, the team doesn’t have any athletes I’ve met so far from the French part of Switzerland. But in an effort for geographic fairness and also to keep things new and interesting, we went there. We spent three days in the Jura mountains. It’s at the same time remote and not remote; growing up in the Upper Valley of New Hampshire and Vermont, I felt right at home. The area is a mix of farms and forest, with some small homestead always hidden behind the next roll of the hill. But the city of Neuchâtel isn’t far, and in no time at all you are back on the big lake, feeling like you’re in metropolitan Switzerland. There are a lot of dairy farms in the Jura. We missed, by just a few days, the annual festival where the cows walk from the high meadows down to town with flowers braided around their horns. On the main road you can find an unmanned, automated cheese vending machine with the local wares. This is the region that absinthe comes from, and you can imagine perfectly how even when it was outlawed, production continued just the same. There are infinite places to hide things and you can’t travel too fast on the country roads. All you need to do is call your neighbor to warn him someone was coming, and he could take care of his materials no problem. The mascot of the Val de Travers region of Canton Neuchâtel region is a small green fairy, and it is plastered everywhere. Come to the grocery store! With the absinthe fairy. Take the train! With the absinthe fairy. Stay at our hotel! With the absinthe fairy. Here’s some highway information! With the absinthe fairy. On our last night we tried some absinthe, which probably ruined our training effect. We stuck to one glass each and, it turns out, did not see the absinthe fairy. Shoot, I’ll have to try some again some other time. 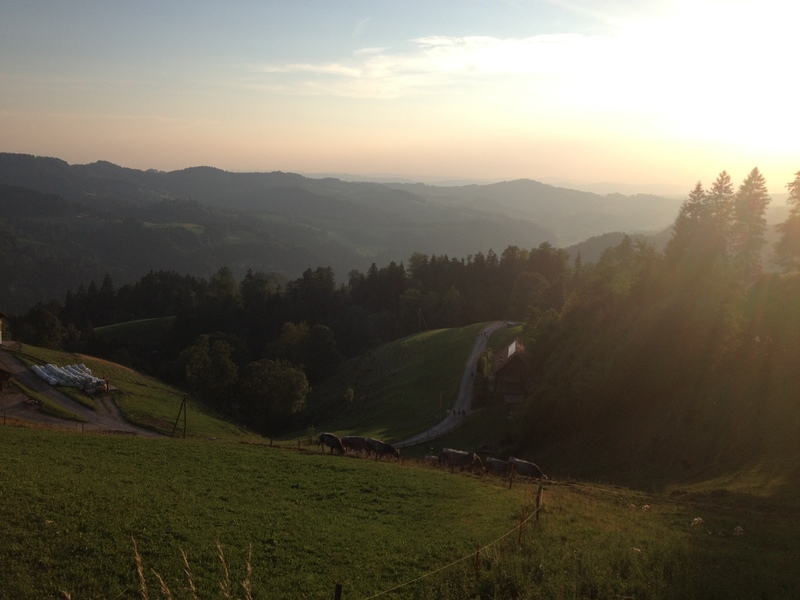 But about that training effect: the Jura is a great place to train. There are tons of trails through the forest, some of which are ski trails. Les Cernets is connected to hundreds of kilometers of ski trails, including a few long point-to-point trails like the 65 k Franco-Suisse loop, where you can do inn-to-inn touring. I can’t wait to come explore in the winter. Jogging the farm roads in the morning through the fog felt mystical. And in the forest, clearings, bogs, and other areas are given fairy-tale names painted on old, peeling signs. I was also thrilled to return to Creux du Van, a huge rock cliff formation which I had hiked with a friend in the spring. The closest thing I can compare it to is Cannon cliffs in New Hampshire – if you made Cannon much more even and bent it in a gently arching bowl around the valley. And plopped a picturesque farm and some happily grazing cows on top. Creux du Van speaks to almost everyone, I think. My housemate told me that being up there, with hundreds of meters of empty space in front of you and birds playing on the wind, gives you power. Sometimes that kind of phrase can sound woo-woo, but when you stand on Creux du Van, it’s not inaccurate. But that’s not why we came to the Jura. A short drive into France is a rollerski loop at the Stade Florence Baverel in Arçon. So every day we would drive to France to ski. The center has a nice biathlon range, a few kilometers of paved trails to train on. I would describe it as if John Morton had been given the assignment to design some kilometers of trail, but only given half the space that he’s usually given in North America. (After all, there’s less space for basically everything in Europe.) And, in this scenario he was also denied vital information about the length of classic rollerski shafts. So it was with some trepidation that I first set out around the course. I’m not a particularly timid downhill skier, but the turns are, umm, very tight – and there’s a pretty decent height differential given the tiny postage stamp of land the center is crammed onto, so you come into them with momentum. There were posters all over the main building for the French biathlon festivals hosted at the venue. I was trying to imagine mass start or even pursuit racing on such narrow trails with such sharp corners. I pictured carnage. I’m interested to try to find video of how it actually works. That said, once I’d made a few trips around the loop, I wasn’t nervous and instead the twists and turns just made for super fun skiing. One corner was still a little dicey on classic skis, but on skate skis you can tear around with little fear of serious repercussions, at least if you don’t get tangled up with someone else. It’s an excellent, and tough, loop for intervals. There’s not much recovery because the downhills are short and technical, so you’re always on your toes. And with limited places to easily pass, it’s good practice for rubbing elbows and making tactical choices in where to use your speed… for instance, before the beginning of the next downhill! I was a bit sad to go back to Zürich and work, and away from the Jura and Doubs regions which seem to be a perfect playground for training in summer and winter. 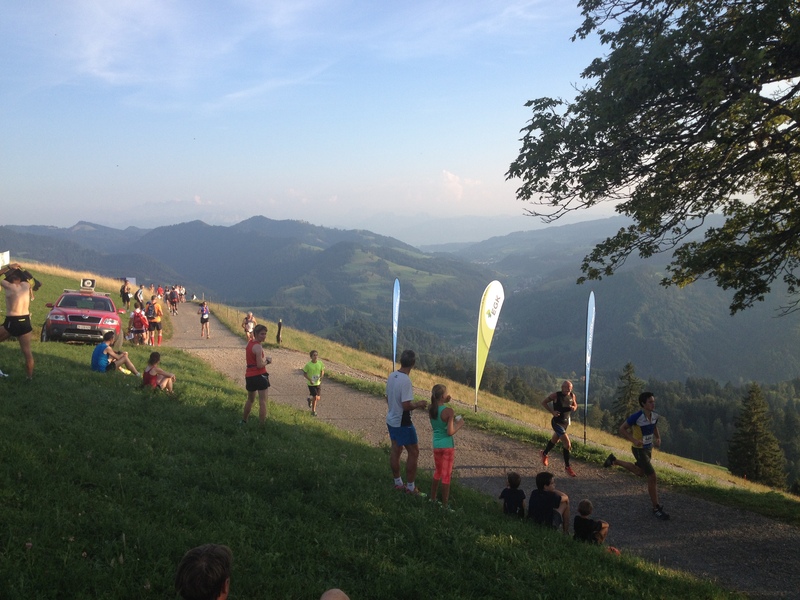 On the advice of a friend, I signed up for an event outside of Zürich called the 5-Tage Berglauf Cup. That means, in English, the 5-day mountain running cup. It was organized by a local ski club and featured five days of racing from small villages up to the top of hills in the Zürich Oberland, a rolling region of farms and rivers to the east of Zürich itself. By the Monday that the series was about to start, I realized that things might not be as easy as I thought. Fabian, who had told me about the series in the first place and had done it many times, wasn’t able to come to any of the races after all. And things are measured in meters here, not in feet as they are in the United States. So when a five-kilometer race has 500 meters of elevation gain, that doesn’t seem like so much… until I thought about what 500 meters really is. 1600 feet. A lot of topo lines all piled on top of each other on a map. 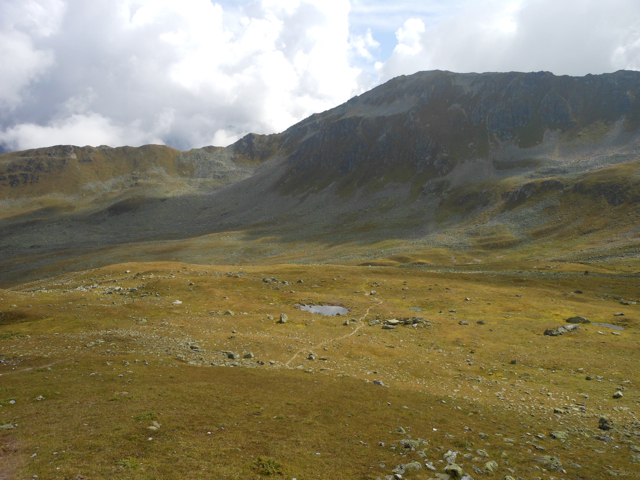 On top of that, I had just gotten back from a three-day training camp in the Jura mountains on the Swiss-French border. I don’t train full-time – I am doing a PhD and hold a part-time job! So I only do these “training camps” with a group of other skiers three times a year or so. When that happens, all of a sudden I’m training twice a day, usually with one session of intervals and one a long recovery workout. It really takes it out of me. I stood on the start line on Monday, not knowing a single other person at the race, and I didn’t feel so great. And I definitely, definitely, only felt worse once we started climbing. I felt like I had made a huge mistake, as a member of the Bluth family might say. At the end of the day, as I was running down from the finish (no transportation is provided, so you have a handy compulsory cool-down unless you make friends with someone whose family drove a car up) I wondered whether to continue or bag the whole thing. Those five kilometers had been hard, not fun. It was hot and humid and I could wring the sweat from my tank top after just over half an hour of racing. I tried to eat a granola bar but it wasn’t going down. Tired from the weekend, I hadn’t been able to push myself, get my heart rate very high, or even have much of a killer instinct at the finish, where the next person in front of me was a 62-year-old man. My dreams of an age-group podium were definitely gone and I knew that I’d be in for a world of pain. I think that I often sign up for races because I believe that going hard will make me feel fit, but this did not make me feel fit! There are plenty of Swiss people who never, ever run up a mountain. But for those who are interested in running up mountains, there’s lots of places to practice and, well, they are pretty expert. As I neared the bottom of the hill and the bus stop where I’d start my hour-and-a-half ride back to my apartment via public transportation, I caught up with a middle-aged guy running backwards and sideways, clearly trying to stretch out his legs after the steep run downhill. “We made it!” I said, holding up my hand for a high five. I don’t think high-fiving is a universal behavior in Switzerland, and he let me hang. But we started chatting, and when I stopped at the bus station, he asked where I was going. Did I need a ride? Zürich wasn’t too far out of his way. My long bus and train ride home was cut to a pleasant 30-minute drive, and my new friend said that “This was the worst one.” By the time I got home, I had decided that I would race the rest of the week. After all, not showing up for a race you paid for seems like chickening out, and I may be slow, but I don’t want to be a chicken. So the week rolled along. I felt a bit better on day two, and had even a good day on day three (good enough that I almost puked at the finish…). My friend Joseph had told me he would come race that day if we had a beer afterward, but then he backed out. So what? I was hooked on this mountain running thing! I ended up racing up 6,000 feet in elevation in four days, with an average grade of 9.5%. As the week went on, fewer 55-year-old women and teenagers beat me. 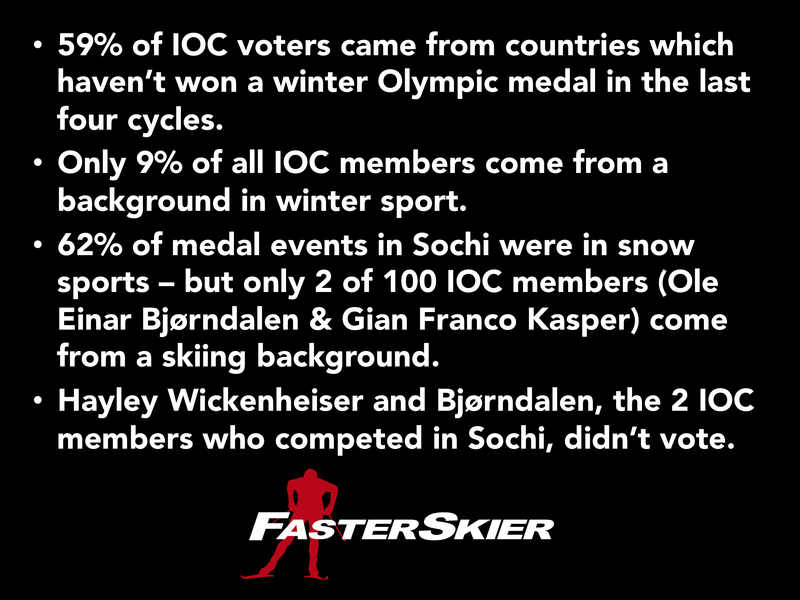 If there’s one strength of cross-country skiers, it’s that we are tough and can take the hits in grueling race series. I was proud to have finished the Cup, especially after sweating all day in my unventilated seventh-floor office in the midst of one of Europe’s worst heat waves ever. Not exactly good race prep. For those of us with day jobs, maybe we enter races for glory. But in the end we finish them for the satisfaction of doing so. Dropping out is not an option, and crossing the finish line is an accomplishment something that most of our coworkers will never be able to boast about. In case you missed my facebook/twitter/researchgate/everything blitz, I finally published my first first-authored paper! It is in Oecologia, a good general ecology journal. I’m really happy and proud of myself, and a number of people have told me that this paper you’ll be happiest and most satisfied to publish, ever. I’m certainly enjoying the new addition to my CV. You always feel that way after you deliver a big piece: unsure if it’s correct, terrified of small mistakes, but sure it’s awesome. That feeling fades. But right now I have the journalism hangover. I even wrote multiple drafts of this, which I am ashamed to admit I don’t usually do. 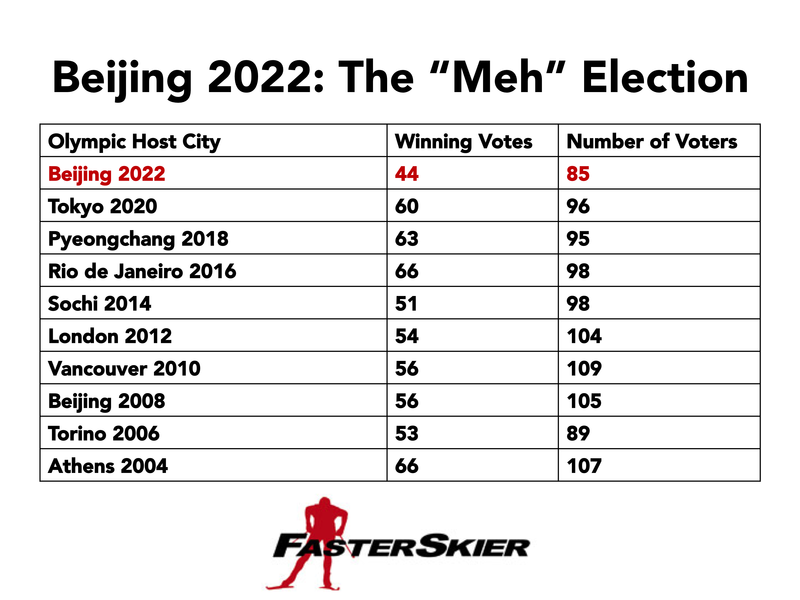 Please go read the piece, “IOC Membership and Regulations Combined to Reliably Hand Beijing 2022 Games,” here. Here are some fun infographics I made to promote it.